You can apply for participation by filling the Application form given below. Once you apply, the Editors Committee will send you an e-mail to inform you whether the article has been accepted to the conference. Before sending the article, please make sure it meets the technical requirements. If you don’t receive a confirmation e-mail within 72 hours, please contact us on the numbers listed in the Contact section. But first, please check your Spam or Junk folder. Please fill this form no later than April 5th 2019. After that date the form will not be available. The conference journal will be sent to this address. This number will be used to contact you if there are technical issues with the attachments you have provided. Please enter a name and surname for the second author of the paper, organization or university where they work, telephone number and address for the submission of the materials. Please enter a name and surname for the third author of the paper, organization or university where they work, telephone number and address for the submission of the materials. Please select one of the listed topics. I will attend and present the paper. I will attend, but I will not present the paper. If your paper is accepted by the Editorial Board of the conference, your paper will be published in the scientific journal, whether it will be presented or not. Maximum document size is 5 MB. Allowed formats are doc and docx. Maximum document size is 5 MB. Allowed formats are pdf, jpeg, jpg, png. The articles of the participants will be published in the conference’s scientific journal after the conference is held. All participants will receive a printed copy of the journal, as well as an e-book after the conference is held. The Organizational Committee reserves the right to make a selection of the papers that will be published. 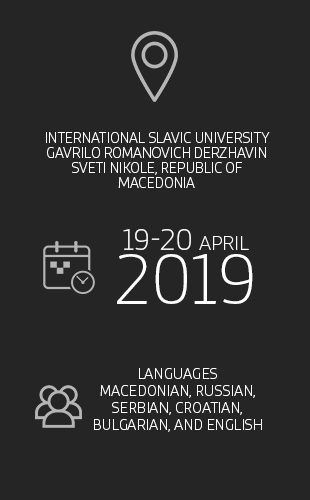 The conference will be held on 19th and 20th of April at the International Slavic University “G. R. Derzhavin” – Sveti Nikole, Republic of Macedonia.